As you are surely aware, the banknotes of Rs.500 and Rs.1000 denominations existing till Nov 8, 2016, have suffered #demonetization. In other words, they are no longer a legal Indian currency. Of course, as discussed earlier, this doesn't mean that such Rs.500 and Rs.1000 banknotes are worthless. As a replacement, new notes of denomination Rs.500 and Rs.2000 have been issued. (And, new notes in other denominations too, will be introduced in due course of time). So, you can exchange the earlier banknotes with the new ones. In this blog post we look at the new banknote of #rs2000 denomination. 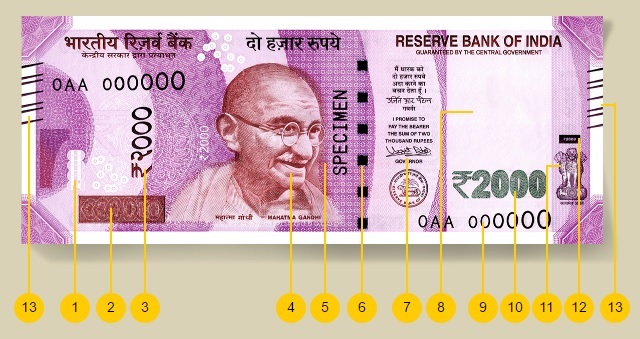 The note, in the Mahatma Gandhi (New) Series which bears the signature of Dr. Urjit R. Patel, Governor, Reserve Bank of India, comes with a new design and numerous features. The base colour of this note is magenta. And, with the dimensions of 66 mm × 166 mm, it is smaller than earlier banknotes of various denominations. This gives the new note a trendy and international feel. In addition, the smaller size results in (a) savings on the printing costs and (b) increase in the printing capacity. Features on the Front of the new currency note of Rs.2000 denomination. 1. See-through register, with denominational numeral 2000, can be seen when you hold the note against the light. 2. Latent image, with denominational numeral 2000, seen when you hold the note at 45 degree angle at the eye level. 3. Denominational numeral 2000 in Devnagari script. 4. As usual, there is a Portrait of Mahatma Gandhi in the centre. 5. Micro letters ‘RBI’ and ‘2000’. 6. Colour-shift windowed security thread with inscriptions ‘भारत’, RBI and 2000. Colour of the thread changes from green to blue when you tilt the note. 8. Watermarks of Mahatma Gandhi portrait and electrotype (2000). 9. 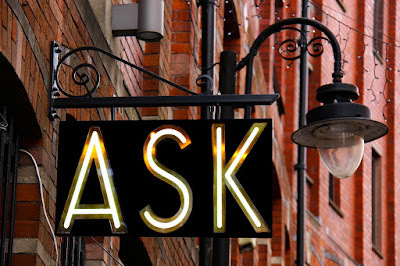 Number panel, with numerals growing from small to big size, is printed on the top left side and bottom right side. 10. Denominational numeral with Rupee Symbol ₹2000, in colour changing ink (green to blue). 11. The Ashoka Pillar emblem on the right side of the note. 12. Small horizontal rectangle with ₹2000 in raised print, above the Ashoka Pillar emblem. 13. Seven angular bleed lines, both on the left and right side, in raised print. Features on the Reverse of the new currency note of Rs.2000 denomination. 14. You will find '2016' as the Year of Printing on the reverse of the note. 15. Swachh Bharat logo with slogan, at the bottom left. 16. The language panel is towards the centre. 17. 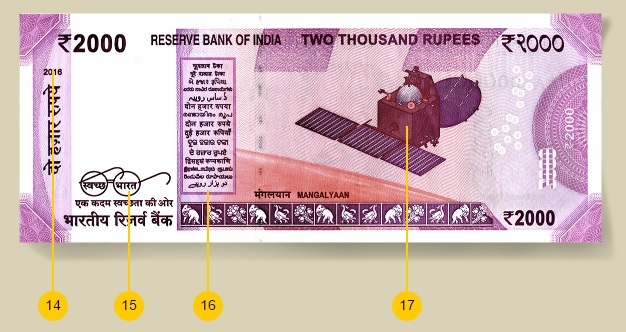 Also on the reverse is the Motif of Mangalyaan, depicting India’s first venture into the interplanetary space. Of course, its too early for someone to try and make a fake counterfeit note. 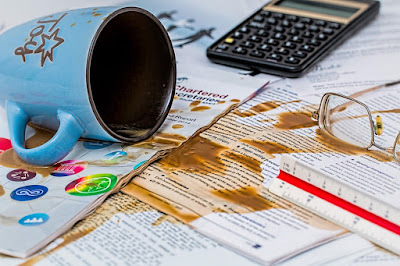 But there was a newspaper report that, one really daring crook made 5-6 "photocopies" of Rs.2000 banknote and palmed them off to a few unsuspecting persons. So, make sure to check these features, before you accept any new Rs.2000 banknote.